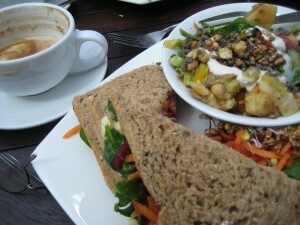 The Humous and Salad Sandwich at Infinity Foods Cafe in Brighton is more like a Salad Sandwich. Two years ago the Grumpy Vegan ventured along the south coast to Brighton to shop at Vegetarian Shoes and eat lunch at Infinity Foods Cafe. Recently, the pilgrimage was made again. Not known for sartorial elegance, the Grumpy Vegan relies upon his existence in two pairs of Vegetarian Shoes. For everyday wear, he has a pair of Spider XT and for when the occasion demands it a pair of Veg Supreme. The former last about a year whereas the latter last much longer with not as much use. So, on this trip, another pair of Spider XT was purchased. He also has an even smarter pair of Vegetarian Shoes (e.g., Airseal Acme) which, given the nature of his social engagements (or lack thereof of a certain type), will most likely last a lifetime. Infinity Foods Cafe is opposite Vegetarian Shoes. Last time at the cafe I had the bangers and mash, which I raved about. This time I had the humous and salad sandwich, a side salad and soya latte. As is often done when sandwiches are made in Britain, the frugal art of sandwich making is used. Which is to say you spread the filling on with a knife and then scrape it off again with the same knife with just enough of the filling left to just about justify its existence and nomenclature as a salad sandwich. In other words, the humous sandwich was a disappointment. 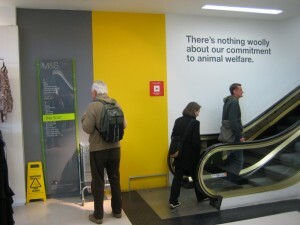 Marks & Spencer in Brighton showing off the company's commitment to animal welfare. Free range: We were the first major UK retailer to sell 100% free range eggs in 1997. In 2002, we introduced the policy of only using free range eggs in all M&S food as well. 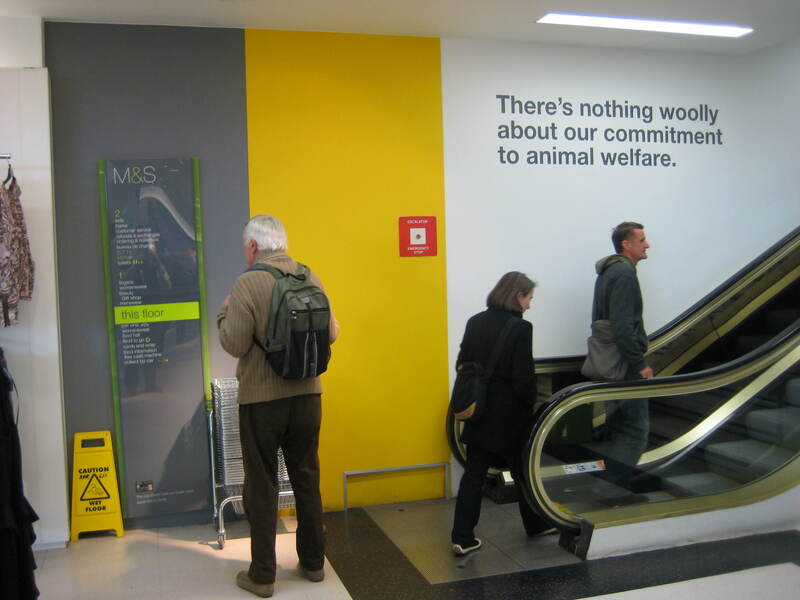 Animal welfare: We’ve never used animals to test our beauty or household products, but from January 2006, no individual ingredients used in M&S products have been animal tested either. Given credit where credit is due and M&S are to be congratulated on instituting their policies. With our encouragement, no doubt, the company will do more, which is where organisations such Compassion In World Farming play a vital role.